The new Tsoi/Kobus and Associates office space, which has been registered for WELL certification. When the engineering and consulting firm Arup recently moved into its new offices on the 10th floor at 60 State Street in downtown Boston, principal Mark Walsh-Cooke soon noticed that something was missing: the sickly smells of carpet, paint, and furniture that normally permeate a new office building. That’s because Arup is aiming to become the first space in New England to be officially certified as a healthy building, part of a growing movement that looks beyond the efficiency of facilities to the well-being of the people inside them. In addition to using materials with fewer chemicals, Arup installed motorized sit-to-stand desks, showers to accommodate people running or biking to work, quiet zones and collaboration areas to encourage movement and minimize distractions, and a filter to reduce the amount of chlorine in the drinking water. The cleaning routine has also been intensified, with light switches and door handles wiped down regularly. There are no vending machines, and the regular Friday bagel offering now includes quiche, smoked salmon, avocados, and Greek yogurt. Each employee also gets a map of healthy lunch spots within a five-minute walk of the office. Most of the lighting is indirect, with fixtures pointed up at the ceiling instead of down to reduce glare, and it changes throughout the day — warmer in the mornings and evenings, cooler and more blue in the middle of the day — to blend with the circadian rhythms of daylight. It’s not necessarily noticeable, but, Walsh-Cooke said, it makes a difference. “The day goes by and I don’t feel as tired,” he said. A growing body of research shows that improving lighting, ventilation, and heat control improves workers’ performance, boosts their productivity, and even helps them sleep better at night. 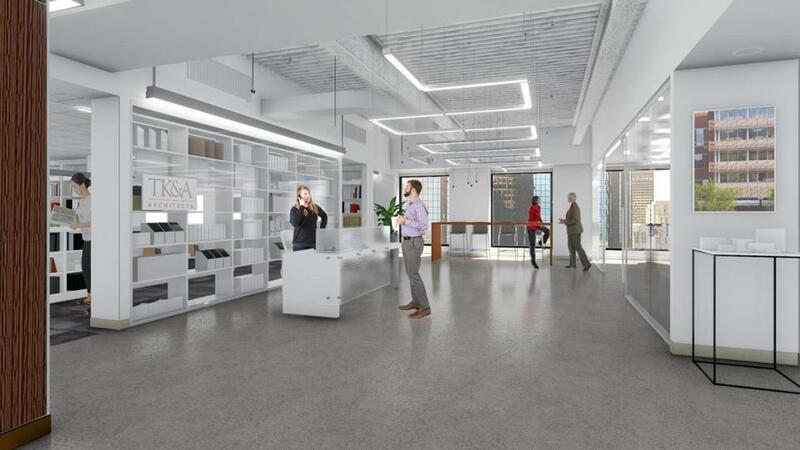 And developers and architects are starting to tout these benefits to potential tenants as a way to attract a higher caliber of employee — and get more work out of them. The interest in healthy buildings is a natural extension of the green building industry, observers say. In fact, the certification for a healthy building — called WELL — overlaps with a number of requirements for LEED-certified environmentally friendly buildings aimed at reducing a building’s greenhouse gas emissions and water and energy consumption. Many projects seek both. The certification Arup is seeking, from the International WELL Building Institute in Washington, D.C., includes dozens of requirements to improve air, water, light, noise, temperature, and other factors, including: lighting that mimics the color and intensity of sunlight; 9-inch wide sinks with 10-inch-long columns of water to keep people from bumping the basin — and coming in contact with germs — when they wash their hands; and vending machines stocked with trans-fat-free snacks with fewer than 30 grams of sugar. In all, WELL lays out 100 standards, including optional conditions that can help a project achieve a gold or platinum rating, such as prohibiting e-mails after midnight — to improve sleep — or using ultraviolet lamps on cooling system coils to reduce mold. Maintaining a healthy building doesn’t have to be that complicated, though, Allen said, noting that his organization has distilled it down to nine foundations that builders and property managers can undertake on their own. More than 300 projects around the world, including seven in Massachusetts, are seeking WELL certification. So far, WELL has been launched mainly in office buildings, at a cost of about $100 per employee, but the goal is to bring the cost down and expand the standard to all buildings, including affordable housing units, said Rick Fedrizzi, chief executive of International WELL Building Institute and founding chair of the US Green Building Council. “Anything that is considered a healthy built environment should be a basic human right,” he said. One of the more provocative findings of working in a healthy building is its effect on people when they’re not on the job. Getting more blue-enriched light that mimics sunlight leads to better sleep quality, Harvard’s Allen said, and people who get a good night’s sleep perform better on cognitive function tests the next day. Working in an office with higher air quality and better ventilation also raises cognitive function scores. Based on his research, Allen estimates that a $10 to $40 per employee per year investment to double the rate of outdoor air being circulated in a building ups the productivity of each person by several thousand dollars a year — and this doesn’t include the associated benefits of reduced absenteeism and fewer people suffering from “sick building” symptoms such as headaches and fatigue. For Tsoi/Kobus & Associates, the Cambridge architecture and interior design firm that will soon be moving into 60 State Street a few floors above Arup, complying with WELL requirements means putting all of its work stations — also sit-to-stand desks — within 41 feet of a window to give more workers the “right to light.” The firm is also building a dining room that accommodates more than half of its 50-person staff at once, part of a “mindful eating” directive to encourage people to have lunch together instead of wolfing down sandwiches at their desks. The new kitchen will also have 9.5-inch diameter plates to encourage people to eat smaller portions. “It’s a big cultural shift for us,” said Elizabeth von Goeler, director of interiors. Of course, this shift doesn’t come without controversy — namely, doing away with junk food. The architecture firm is eliminating vending machines, as well as the popcorn machine and the giant candy jar at the front desk. One of those people is office manager Laura Allen. Allen is all for adding healthy food options but doesn’t see why all the treats have to be taken away. Allen supports the consciousness-raising of the healthy building movement — reminding people that they spend a huge portion of their life inside an office, and working to offset the physical and mental harm that can do.